Moscow is grittier. St. Petersburg is more refined. Getting there and getting around poses some unique challenges. 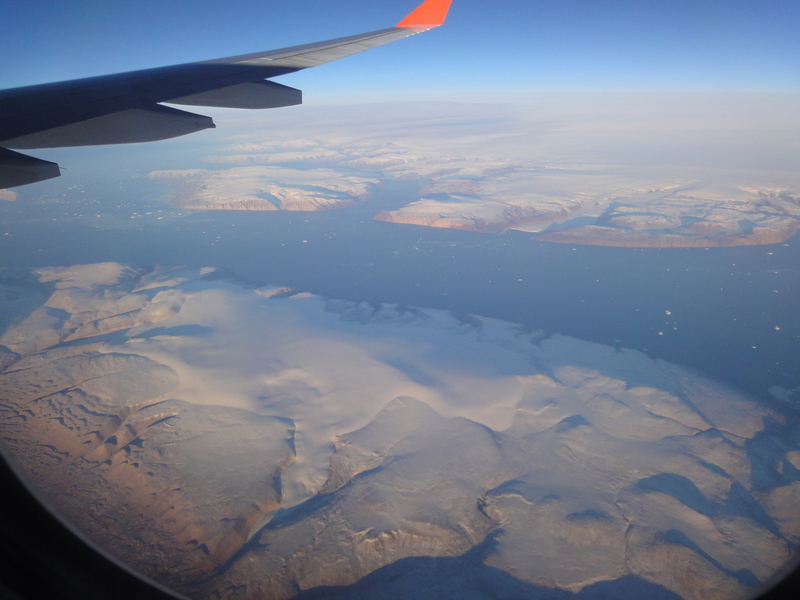 First, I made the frugal but brave decision to fly Aeroflot – they had the cheapest ticket I could find at the time. At first I couldn’t check in online, as the Aeroflot site was under repair and a few weeks past the deadline for when those repairs were supposed to finish. Scrolling to the bottom of the page though, I found a link that allowed me to choose my seat and print a boarding pass. An Aeroflot attendant ripped it up at the airport, and issued me a new pass. Same seat, so I was content. Got on the plane, only to find that the entertainment system was broken. No movies, no games, no map of our progress for 12 hours. My seat mate, who flies Aeroflot regularly, told me this happens a lot. Bring an ipad. He didn’t have anything, so we took turns playing Angry Birds on mine. Apropos, no? Caution: Icebergs lure drunk passengers practically into your lap. Don’t fly Aeroflot. Food was ok, except for the iceberg lettuce salad and French dressing, which I haven’t seen served since the fall of the Communist regime. The chocolate mousse-like dessert was pretty tasty. The orange mousse-like dessert was tastier. The return flight was better, though the plane landed two hours later than scheduled. No problem checking in, watched a few movies, and the food was better. No French dressing. The only other problem was the drunk passengers passing around shots – one of whom kept wanting to lean over our seats to look out the window. Getting lost in either city is a given, especially when your phone dies halfway through the day and you lose Google Maps. The main problem in that scenario is in reading the street signs, since the Russian alphabet is a form of Cyrrillic. A Green Line Station in Moscow. I believe this one was used for Communist Party events and as a bomb shelter. For example, the nearest metro station to my hotel in Moscow was the Dynamo station named for Dynamo Stadium, written in Russian like this: Дина́мо. That doesn’t look too bad, does it? Don’t get too confident though. The only metro station where you can connect with the Aeroexpress Train to Sheremetyevo Airport is Belorussky Station, which looks like this: Белорусский вокзал. ­­How are you supposed to figure something like that out? Thankfully, a female police officer took pity on me and pointed me in the right direction after watching me study a map in blank confusion for a good 10 minutes. By the way, Belorussky Station is on the Green Line, at the intersection of the Brown City Circle line. You’ll have to leave the subway station and walk around it to find the entrance for the Aeroexpress Train ticketing. Russian literacy challenges for Westerners aside though, the subway stations in both Moscow and St. Petersburg are very easy to navigate. Better yet, you can hop lines all day on one pass, if you don’t ever emerge from the underground, for about US$1. Which is good if you’re perpetually lost. Moscow uses a disposable smart card, which you can load up with one trip or multiple trips. St. Petersburg stations use tokens, which will be replaced with smart cards soon. Buy your trips at the ticket windows or via vending machines in the stations. 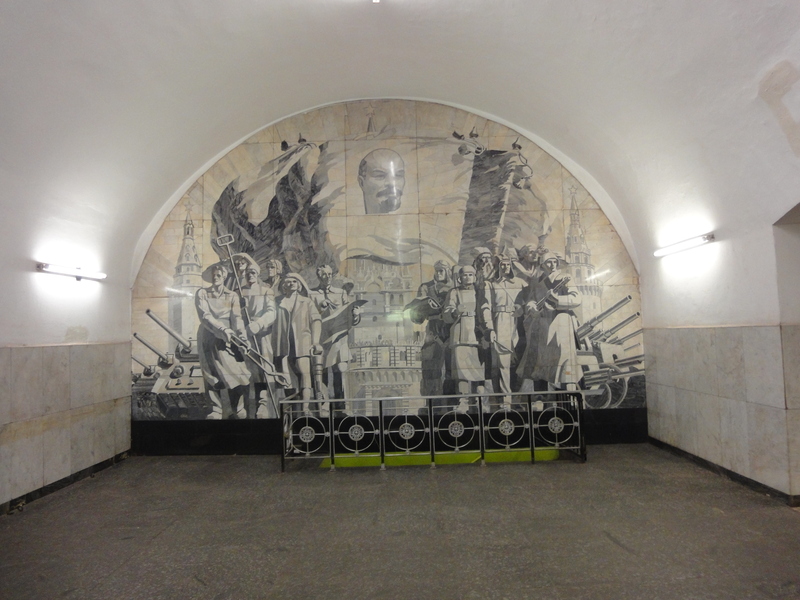 Subway stations in Moscow are decorated with murals, statues, ceiling paintings. Didn’t notice the same in St. Petersburg, but also didn’t use the subway as much. On the escalators into and out of the metro stations, stand on the right, and pass on the left. If you stand still on the left, someone will inevitably and not very gently nudge you out of their way. The Moscow subway stations post maps strictly in Russian, until you get on the trains, which have maps labeled in both Russian and in the International Phonetic Alphabet (IPA). St. Petersburg stations have maps written both ways in the stations and on the trains. Street signs in the Burg are also written both ways, though the IPA is in a much smaller font. 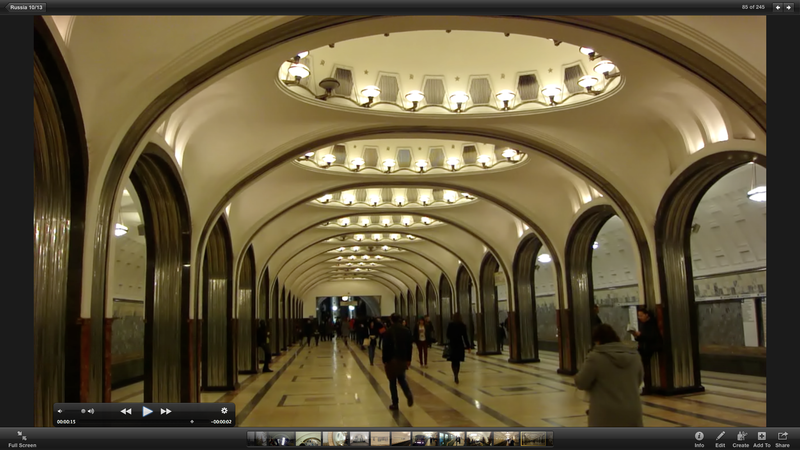 The subway stations in Moscow are works of art. Some of them held Communist Party meetings in the middle of the last century. Most of them are decorated from stone, marble and fixtures of beautiful churches destroyed by the Communists. If I had more time, definitely would have spent an afternoon train-hopping. I tried buying rail tickets to and from St. Petersburg online, through the Russian Railways website. Unfortunately, I couldn’t complete my transactions, which meant buying tickets at the last minute. This forced me into first class on a Sapsan Train, which I loved. The attendant was fluent in English, brought me the Moscow Times in English, offered me American coffee instead of tea. It’s the only way to go, especially since it’s only a four hour trip. Wikipedia says the Sapsan lines are Russian Railways’ only profitable train service. Considering the crowds, I find that unlikely, but who knows? Returning to Moscow on an 8 hour sleeper train though, I was forced into a “couchette.” Moral of the story? Buy tickets a few days in advance, and take the high speed Sapsan. One other tip: Google Translator helped me buy my return ticket. 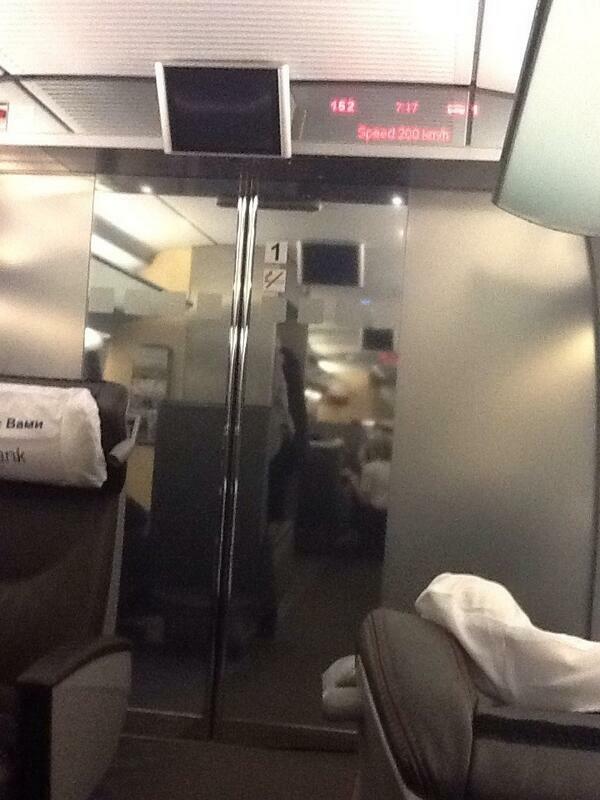 I just handed the agent my phone in which I typed First Class cabin, sleeper train, time, date and destination. The agent seemed appreciative of my efforts, preferring that to trying to communicate via hand gestures through a bulletproof glass window. Too bad there were no first class sleepers left. Moscow River on the left, Kremlin on the right, with a small taste of Moscow traffic weaving in between. I also watched three cars pull a u-turn from the middle of a gridlocked intersection…a feat I would not have wanted to attempt. Luckily, I wasn’t driving anywhere. Traffic jams looked pretty bad, even by L.A. and NY standards. Moscow is full of unlicensed taxi drivers. Just stick out your hand, someone will pull over, and the two of you negotiate destination and price. If you’re walking, they will pull up next to you and ask if you want a taxi. Traveling alone, I didn’t want to try it. Just say “nyet” and keep walking. Licensed taxis look almost the same as Western taxis, except that there are no meters. I suggest getting a price quote before starting out. That worked every time except once, when the driver quoted 200 rubles, but then told me it was 2,000 at my destination. He claimed language barriers. But considering he lowered the price to 1, 500 and then 1,000 when I told him I didn’t have the cash, I’m pretty sure I still got robbed. This happened in St. Petersburg. Maybe write down the figure to get confirmation before starting? Better yet, ask the concierge or front desk agents at your hotel to call a taxi for you, and to get a price quote. 1. When possible, book tickets in advance. Train tickets however, are nonrefundable, so make sure you ‘re sure of your plans. 2. Translator apps and body language are your friends. When asking directions it helps to plug your questions into a translator, or to simply pull up a photo of the museum or destination you are trying to find. Add a questioning facial expression and you’re generally understood.